All of us have recollections of our grandmothers and mothers stirring the pot on the stove as we returned from school with the enervating hunger pangs. The whiff of the sweet aroma would fill our nostrils and bring a smile on our faces. Kitchen is a place where memories that last a lifetime are created. From a small cup of filter coffee to a sumptuous festive meal for the whole family, it all originates in the kitchen and brings the loved ones together. It is a place where recipes that last generations are invented and vital stories are told. The space utilization is better in the modular kitchen which makes it possible to create best possible kitchen in the smallest of area. The individual parts can be brought together in the kitchen by understanding your specific needs to create a kitchen that is easy and convenient to use. Repair and renovation is easy as individual parts can be replaced or repaired as required. Installation and maintenance is simple as individual parts can be fitted and cleaned effortlessly. With so much variety available in the market, it is difficult to make a choice. Also, most customers have no experience or understanding of the kitchen design which makes it even more challenging to make an informed decision of what best fits their needs. But worry no further! We will guide you on how to purchase a modular kitchen for your home. Budget: Yes, you read it right. This is where it all begins. You first need to decide on how much you can spend on your kitchen. Depending on your budget, you can decide on what materials and specifications you can work with. 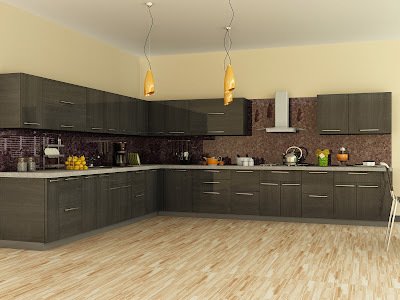 Customization: You need to consider if you can customize the modular kitchen according to your needs and space. 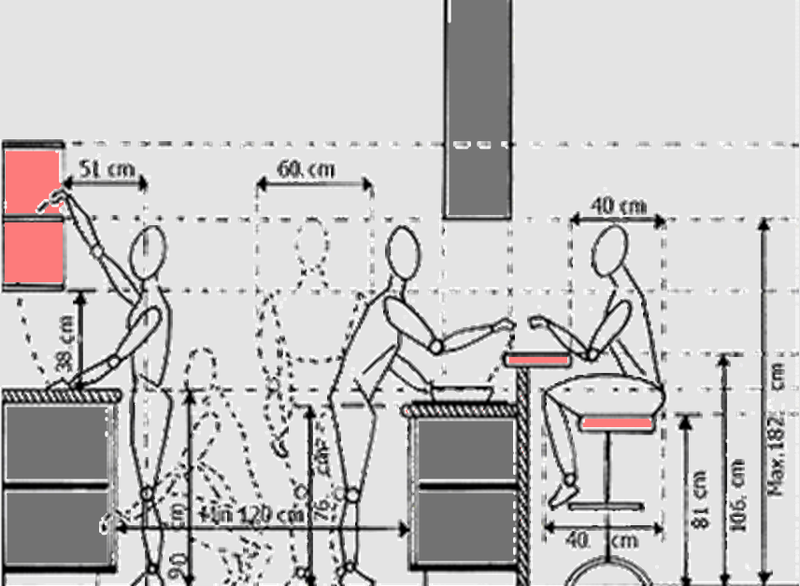 Kitchen Shape: The shape plays a vital role in both the usability and space utilization of the kitchen. The general rule is to have refrigerator, hob, and sink not placed too far apart, and have them form a triangle so that everything is accessible. Placing the refrigerator at the entrance also allows you to put the fruits, vegetables, and milk directly from the shopping bag to the refrigerator and lets other members in the house have easy access to the fridge. Some of the common shapes of kitchens are parallel, straight, L-shaped, and U-shaped. However, if your kitchen is quite large, you can opt for island kitchen. 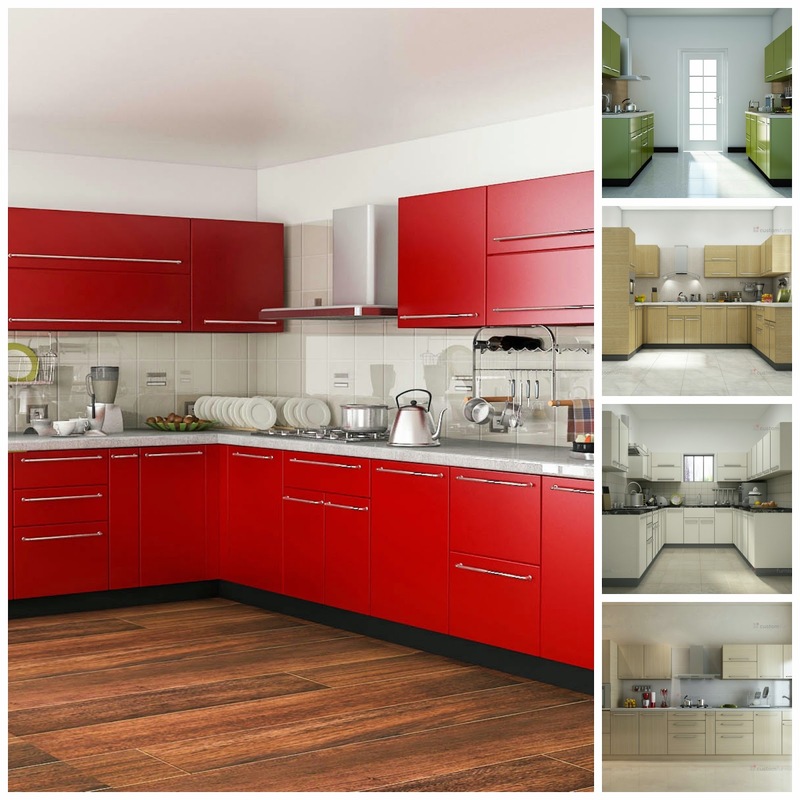 Cabinets, drawers and doors: It is significant to choose a durable material for the kitchen cabinets and drawers. As the kitchen is exposed to significant moisture which can damage certain materials, it is best to use boiling water proof (BWP) plywood with lamination. However if you want a glossy finish, MDF with acrylic finish is the best option available. 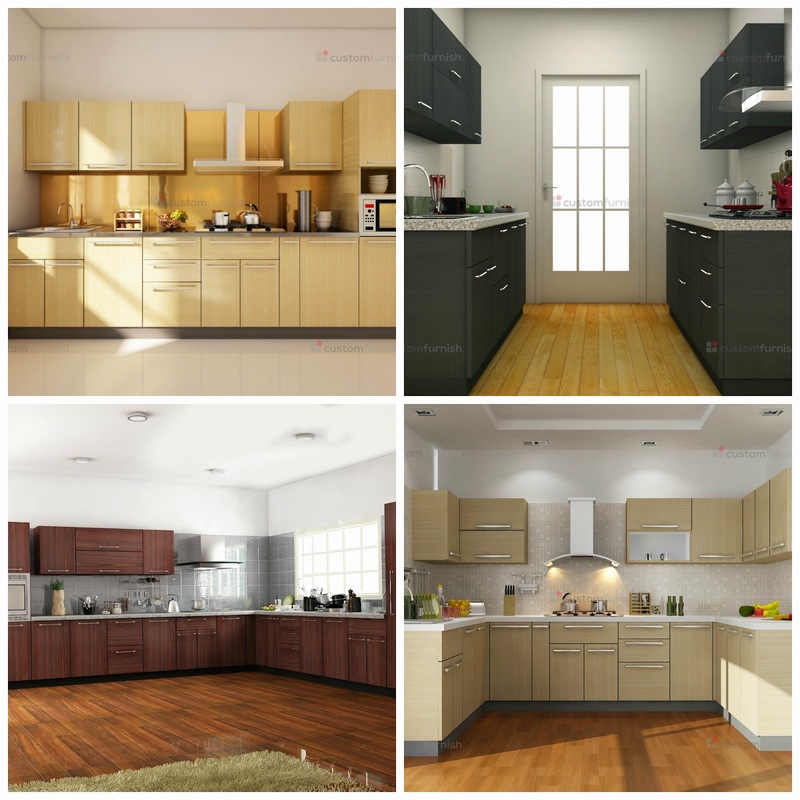 Other materials used for woodwork in kitchen are pre-laminated particle board, MDF membrane, pre-laminated MDF, and MDF membranes. Kitchen Countertop: The countertop is the flat surface in kitchens used for preparing food and is most commonly supported by the cabinets in the base units. A wide variety of materials such as granite, marble, wood, crafted glass, or metal could be used. Some good options for the kitchen countertop are Solid surface top, Granite- LITE, Granite- Premium quality and boiling water proof (BWP) plywood with lamination. Premium quality granite is the best option for Indian kitchens because it is resistant to heat, mold, and scratches. Also, it is available in different patterns and designs which can be combined and contrasted easily with other components of the kitchen. 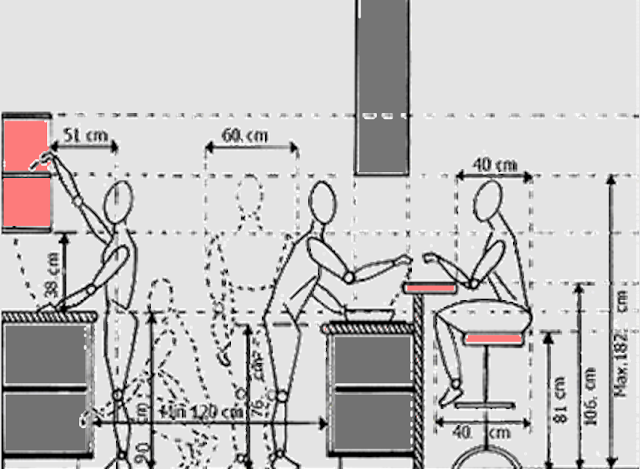 Height and depth of units: The height of the base units, wall units, and tall units is vital to a comfortable design of the kitchen from the usability perspective. 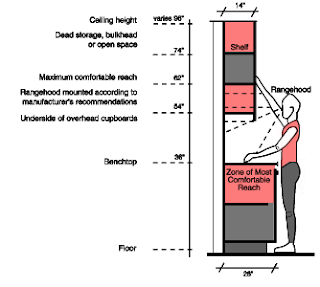 Although, there are some general guidelines as to what the dimensions should be for ergonomically designed units, you can customize it according to your height. Drawers and trays are preferred in the base units as it is below the eye level and you can easily access things lying at the rear end by pulling out the drawer. It helps to avoid the painful bending. Also, as a general rule it is better to have cabinets as the wall units because drawers are uncomfortable to use above your eye level. You can choose what you want to store in the base, wall, and tall units and customize the insides of the units accordingly. Kitchen sink: It is a plumbing fixture used for cleaning dishes, washing vegetables, and fruits. Sinks must have good width and depth so that all dishes can easily fit. Stainless steel, ceramic, granite, marble, and terrazzo are most commonly used materials for the sink. The faucets or taps could have both hot and cold water outlets depending on the weather conditions. The faucet is generally long handled and sometimes has a spray fixture attached for the faster rinsing. Kitchen Color: It might be listed last here yet aesthetic appeal of the kitchen rests significantly on the colours used. You can use bright colors and contrast the tiles and cabinets or you can use a similar theme across the various components of the kitchen. The shades and hues used set the tone and mood of the kitchen that might reflect on the food you cook for everyone in the long run. So, before you go out to buy various components of your kitchen make sure to pay attention to these aspects and design a dream kitchen for your home. 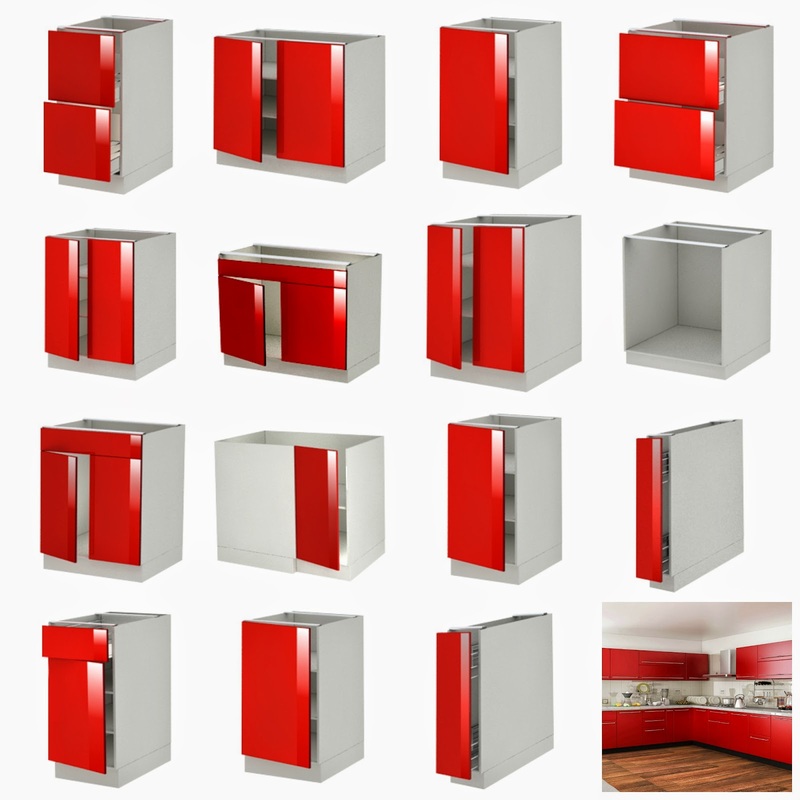 At CustomFurnish.com, we allow you to customize even the modular kitchen according to your needs as we understand needs vary from customer to customer. We specially cater to the needs of an Indian consumer and use the best quality material at affordable prices. As the entire modular kitchen is manufactured in the factory, our price is 30% lower than the market price. Once manufactured, our team of experts transport it customer site for hassle free assembling. Your mode of describing the whole thing in thiis paragraph is really pleasant, every one can effortlessly understand it, Thanks a lot. yet I never found any interesting article like yours.